Anaerobic bacteria do not need oxygen to grow. An anaerobe is an organism which is capable of thriving in an environment without oxygen, and in some cases may actually need an environment with limited or no oxygen to live. Many anaerobes are microorganisms, but some larger organisms are also anaerobic, such as the massive tubeworms found near hydrothermal vents. Anaerobes are of interest to humans for a number of reasons, not least of which is that some can cause infections and disease when ingested by humans. A true anaerobe is known as “obligate,” because it needs an environment without oxygen, and it cannot survive in areas with atmospheric oxygen. Facultative anaerobes, on the other hand, can live in areas with varying levels of oxygen, taking advantage of changing conditions. Other types of anaerobes have oxygen requirements which differ from the norm, such as microaerophilic organisms, which need low levels of oxygen to live. Some of these organisms use fermentation to gather energy, while others may utilize anaerobic respiration, in which gas exchange takes place with gases other than oxygen. In the case of facultative anaerobes, either anerobic or conventional respiration can take place, depending on the environment where the organism is living. 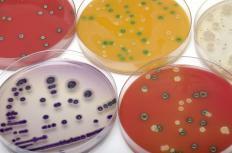 Scientists can isolate aerobic organisms from anaerobic organisms with the use of a liquid culture. The aerobic organisms will cluster near the surface of the culture so that they can access oxygen, while the obligate anaerobes will settle to the bottom. Facultative, microaerophilic, and related organisms will distribute themselves across the middle of the culture to find the oxygen saturation levels they require. Being able to live in water does not necessarily make an organism an anaerobe, although water is a liquid. In fact, water is quite high in dissolved oxygen, and as a result, most organisms which live in water require oxygen to live, although they access oxygen differently than surface dwelling organisms do. Fish, for example, perform gas exchange with their gills, pumping water through the gills and capturing the dissolved oxygen as it passes by. In some cases, an anaerobe can cause disease in humans. Botulinum toxin, for example, is created by anaerobic bacteria which can live in canned food which has become contaminated. Other anaerobes can actually be beneficial, as in the case of organisms which ferment milk to create yogurt, cheese, and other dairy products. Fermentation is also the key to the production of wine and beer. An anaerobe can also be utilized in the production of a wide assortment of chemicals and other useful products, with the use of a bioreactor in which a controlled environment which is friendly to the organism can be maintained. What Is an Anaerobic Infection? What is an Anaerobic Threshold?